In subsequent chapters Dr. Mohler lays out the DNA of a “believing leader.” He tackles topics such as conviction, character, thinking, teaching, reading, writing, communicating and even death and legacy. His book truly prepares men and women for greatness. Although you may not agree with all of the author’s convictions and views, you will most certainly benefit from his leadership wisdom. Mohler’s book should be read and reread by leaders for years to come. Dr. Albert Mohler is a theologian whose opinions have appeared in numerous major media outlets. He is also the author of seven books on religion and culture. 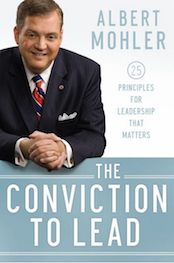 Published by Baker Publishing Group, “The Conviction to Lead” demonstrates Dr. Mohler’s belief that true leaders transfer their convictions to others.